This terms and conditions template is suitable for sites that primarily provide information but also contain features that allow visitors to interact with the site, whether posting comments on an article or blog, or exploring an interactive product model. websites of charities and not-for-profit organisations (such as members' clubs or sports clubs). This template does not include provisions for payment or subscription for access, so your site should be free to browse. Although it is slightly 'lighter' on terms governing how visitors use your site than the alternatives we offer (see below), this template still contains numerous provisions to help protect your site and your business. protect your site from complaints about content that your visitors posted. 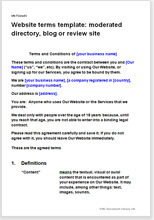 Website terms and conditions template: news, wiki or community site; free-to-access model is suitable where content is primarily contributed by the users of the site and where the site aims to foster an open community. Examples of such sites would be free-to-access forums, wikis and community driven information portals. Like this template, it contains extensive provisions relating to use of content and interaction with the site and other visitors. It differs from the template above only in that it doesn't contain terms relating to on-site subscription for access. This document contains paragraphs that provide some intellectual property protection, governing how your site content can be used by your visitors.